During the Islamic holy month of Ramadan, Muslims all over the world will spend their days fasting to honour the first time Muhammad was visited by the archangel Gabriel and shown the Quran for the first time. From sunrise to sunset, followers must practice self-discipline and abstain from food and drink during certain hours and only dine before dawn, during suhur, or after dusk, at iftar. Social feasts are a common occurrence of iftar; as it is a great time for friends and family to come together and enjoy delicious foods as one. If you are planning an iftar celebration, be sure to consider the following menus, each sourced from a distinct corner of the Islamic world. Iftar tables in Morocco are commonly filled with all kinds of pastries, ending the fast with crisp, light bursts of flavour. Central to the meal is briouat, filo pastry pockets often filled with minced lamb, fish, poultry and cheese. There are sweet versions too, typically filled with flavoured almond paste and dipped in sweet honey. For those searching for something more meaty, chicken and turkey brochettes are a perfect choice – light and lemony, these kebabs can be eaten alone, or with a traditional Moroccan bread such as khobz b'chehma (stuffed with onions, parsley and suet), or chewy, pocketed batbout. Desserts are just as exciting – halwa chebakia flavoursome sesame cookies, as well as the dense and delicious sellou: are Ramadan essentials in Morocco. While iftar menus differ from family to family across the Arabian Peninsula, there are a variety of excellent sweet and savoury dishes, all of which are popular for good reason! For many Arabic Muslims, many post-Ramadan meals begin with a large glass of milk served alongside sweet, sticky dates. These are often paired with jallab, a thirst-quenching beverage containing grape molasses, rose water and raisins, mixed with cold water and ice – the perfect way to rehydrate after a long day fasting. Lamb features heavily in many Arabic dinners during iftar. Slow-cooked in stews such as harees, or with ouzi, roasted and made very tender - there are a lot of spice and herbal combinations to try with this versatile meat, usually served with rice and unleavened bread. After the main courses qatayef are served. These are something in between dumplings and pancakes and are sweet as they contain cream – a delicious treat resembling the crescent moon. 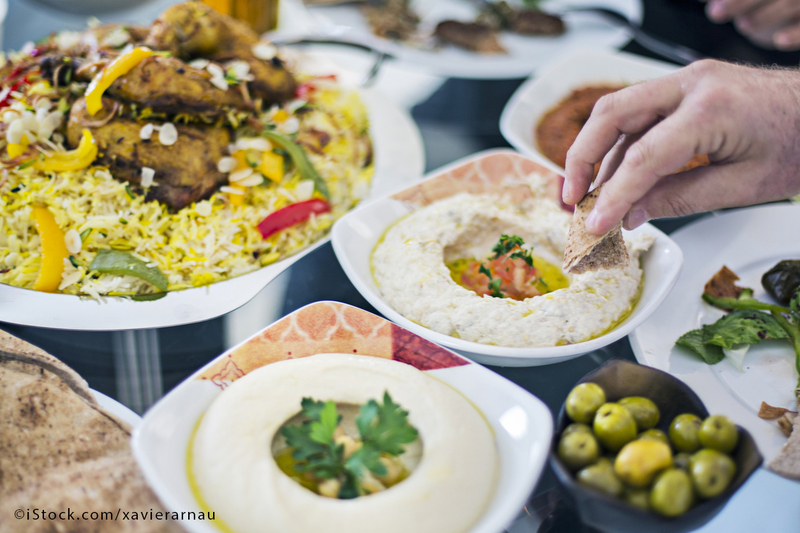 Persian cuisine has a lot in common with classic Arabic and North African dishes, although anyone enjoying an iftar meal here is sure to discover something new and interesting. After a traditional serving of dates and tea, diners might start with a bowl of ash-e reshteh, a thick winter soup made of thin noodles; green herbs like parsley, spinach, dill and spring onion; and pulses such as chick peas, black-eyed beans and lentils. Bright green and full of flavour, it is a great dish to awaken the senses after a long day. Slow-cooked stews such as the wheat and red meat-based haleem may also be served, as well as golden shami lapeh, spiced and fried patties made from beef and yellow split peas. Persian iftar desserts are more commonly a pudding style – try a serving of sugary, creamy fereni or shir berenj, or sholeh zard flavoured with saffron. This coming Ramadan a range of our destinations will be hosting special iftar meals – for more information, click here to contact us.